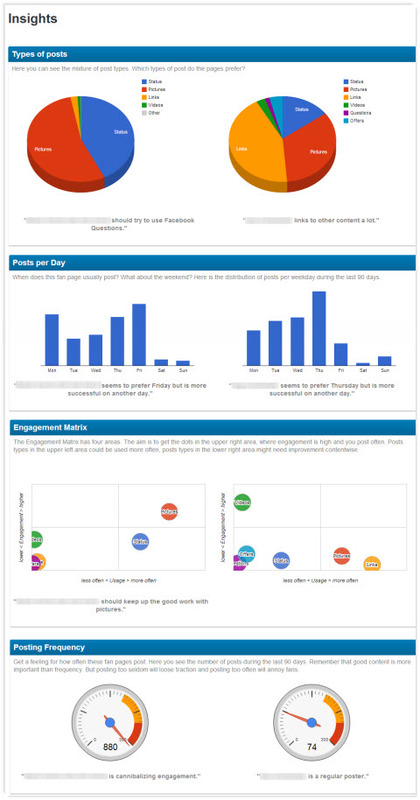 Are you wondering how your Facebook Page compares to competitors? Insights into how your competitors are using Facebook can help you better understand your audience on Facebook and how they use Facebook. In this article, I’ll review 5 different tools that can be used to help you compare your Facebook Page against competitors and identify tactics to help you improve your Facebook marketing. AgoraPulse provides a free tool called the AgoraPulse Barometer, which performs an analysis of your Facebook Page and compares it against other companies’ Pages (that also used this tool) that have a similar number of fans. 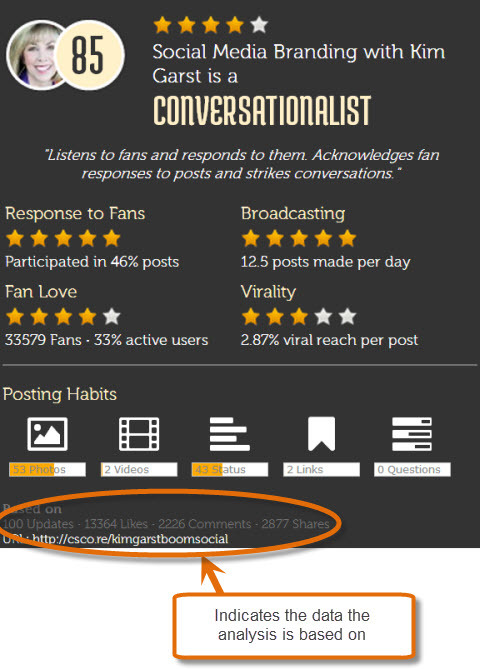 The Barometer calculates the average percentage for several criteria based on your last 50 posts. The resulting report shows the score for your Page in black compared with the average score in red for other Pages that ran this assessment. 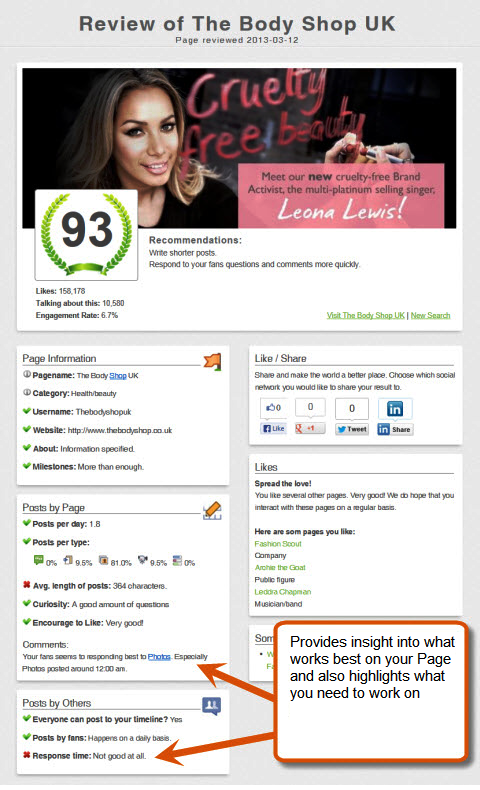 The table gives an assessment of your Page compared to other Pages with a similar fan count. Fans Reached. This is the average number of fans who receive your content. Facebook generally shares your content with a small percentage of fans unless you have a very engaged community. The key to increasing this figure is having a community that comments, likes or shares your posts. Engagement. This is the average percentage of users who’ve seen your post and then either liked, commented, shared or clicked on the post. If you focus on increasing this figure, it will help your Page significantly. People Talking About. This is similar to engagement, but doesn’t include people who clicked on the post, so it will always be lower than engagement. Negative Feedback. This is the average percentage of users who gave negative feedback by hiding a single post, hiding all Page posts or reporting a post as spam. Viral Reach. This is when people who are not fans get to see the content you shared. This could be because the content gets shared out by your fans to their friends. Organic Reach. This is the average percentage of fans and non-fans who see your content when it’s posted. Click-Through Rate. This is the average number of people who interacted with your posts by watching a video, clicking on a photo or listening to an audio file. As well as the above table, there is a drill-down provided, which compares some of your Page’s statistics against the average achieved through other people who ran the Barometer report for their Page. You can view a breakdown of each area in graphical form. Monthly Organic Reach. Percentage of people who saw at least one post on your Page over a month. Monthly Viral Reach. Percentage of friends of fans who saw at least one post as a result of their friends either liking, commenting or sharing. People Talking About This (monthly). Your fans who liked, commented or shared at least one post over a month. This excludes viral or paid reach. With AgoraPulse Barometer, you can produce a very easy-to-understand summary report of your Page’s performance, and focusing on how you compare against competitors helps you strive for improvements. I covered LikeAlyzer in more detail in a previous article, but it’s still a tool that I find is very popular due to its simplicity. LikeAlyzer gives you a rating out of 100 in comparison to other Pages and gives you some recommendations on how you can improve your Page. The following shows the type of report that LikeAlyzer produces. 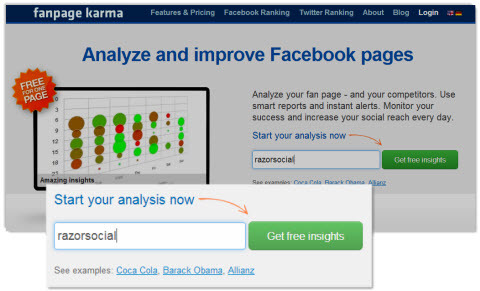 LikeAlyzer provides you with a very easy to understand assessment of your Page. Page Information. It will check that you have filled out information on the Page with sufficient details such as the website name and some milestones. Posts per Day. You need to post regularly every day on Facebook. One of the main reasons is that most people don’t see your posts and some posts may not resonate with your audience, so you need to post frequently. Posts per Type. It’s important to include a variety of post types on your Page. Pictures get a lot of engagement, but text-only updates recently started doing well on Facebook. The key is having a variety of posts. Average Length of Posts. Shorter posts typically do better than longer posts, so a post with a shorter text update is better. Curiosity. Questions get more interaction and the more interaction on the Page, the better it will perform. Encourage to Like. If you encourage people to like a status update, they are more likely to click like. For example, saying “Click like if…” followed by a statement works well. You don’t encourage clicking like with every status update, but you should consider using this occasionally. Posts by Others. This assesses how responses from fans are dealt with. Everyone can post to your timeline. Interaction on your Page is good, so it’s better if you allow people to post on your timeline. Posts by fans. Are fans posting enough on the timeline? You want fans to put up their own posts. Response time. This is how quickly you respond to interaction from fans on a Page. Fans expect you to interact quickly! You can see at a glance what you’re doing well, but more importantly it draws your attention to the areas you need to focus on. As well as running a report for your Page, you can also run the report for a competitor’s Page and then do a comparison. If your competitor gets a higher score, you can see what areas they are scoring better in and get some ideas for making improvements. Fanpage Karma is a paid tool that provides a free version that allows you to do a fairly detailed analysis of your Facebook Page and a comparison with your competitors. Start by entering your Facebook Page name or the Page name of your competitor and click on the button to get free insights. Enter the name of the Page you want to analyze. When you run the report, you see an initial table for Key Performance Indicators (KPIs). This gives an initial assessment of the Page based on certain metrics and provides an overall Page performance score. Overall summary of the Page’s key performance indicators. Fans. Total number of fans of the Page. Growth. Growth of fans over the previous month. Talking About. Fans on Facebook who are interacting with Page updates. Posts per Day. Average number of posts per day. Response Rate. How many Page posts made by fans get a response from you. Response Time. How quickly you respond to fans. Post Interaction. The average number of comments, likes and shares compared to the number of fans of your Page. Page Performance. This is calculated using a combination of the growth of fans and engagement and is scored out of 100. A more detailed analysis of the Page is also provided that contains many interesting graphs. Here’s an example of one of the graphs from each section. Content. 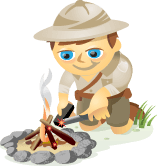 Overall details related to the content including a posting history, details of the strongest and weakest posts, details of interaction on all posts over that period, most frequently used words and links and a graph of the average length of posts. This shows you the average length of posts and the post types. You can also click on the circles and see what the post was related to. Times and Types. 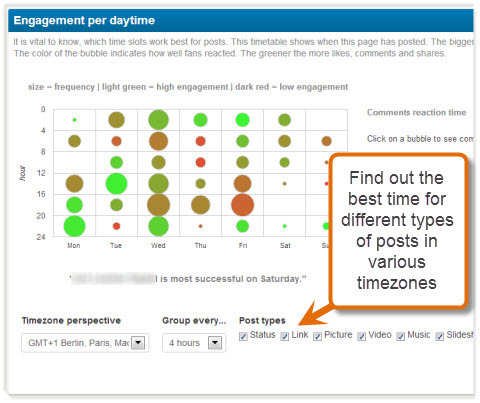 This shows what, when and how often posts were added to the Page, the best engagement by time of day and details of posts by post type. Find out when is the best time to post. Influencers. Who are the most active fans, where do they come from and which other Pages are they most active on? This is very useful to see which of your competitors’ fans you should target! 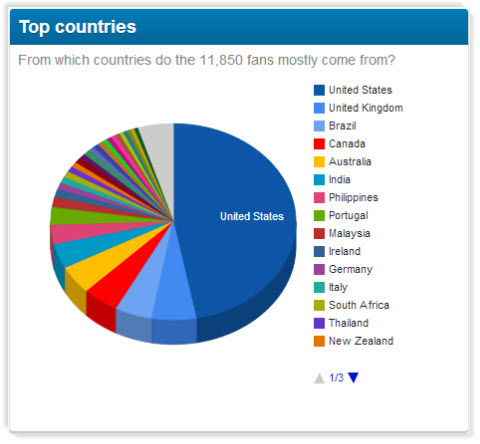 A breakdown of fans by country. Fan Posts. Indicates the most popular fan posts on the Page; that is, the ones that got the most reactions. It also indicates the percentage of fan posts that the Page responded to, as well as how quickly the Page reacted to those posts. Percentage of posts from fans that the Page commented on. Ad Value. The cost of reaching the same number of fans if you used paid advertising. This is calculated using the industry average cost per thousand impressions (CPM) for online marketing. If you upgrade to the premium version, you can get a more accurate analysis of your actual spend on advertising compared to the visibility you are getting organically. Shows the equivalent value of these posts if you had to pay for them using online advertising. History and Benchmarking. Provides details on the historical performance of the Page, so you can see how it has performed over a certain period of time. You can also compare the Page’s performance against other Pages in the same category and Pages of a similar size. Details of how many people are interacting with the content. You can also run a side-by-side comparison with another Facebook Page. Just select the option to compare two fan Pages. Select the option to compare two fan Pages and enter their Page names. 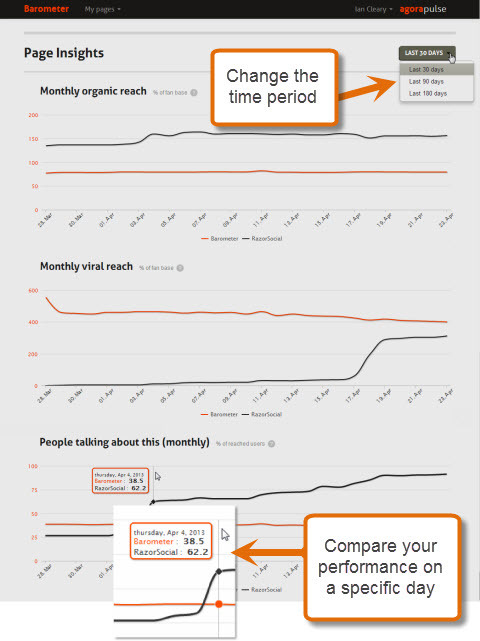 Once you enter the two Pages you want to compare, Fanpage Karma will display a detailed side-by-side analysis. The initial chart displayed is an overview of the performance for each of the Pages. From this you can pick out very interesting comparisons. 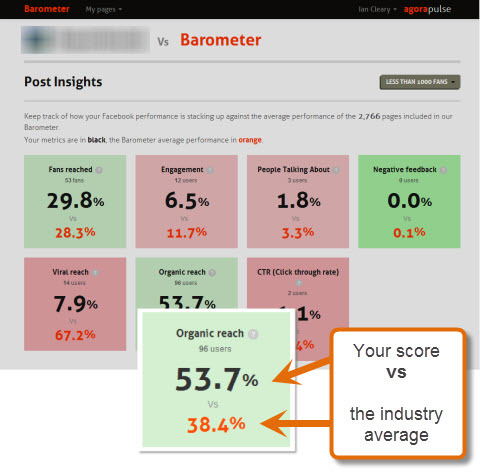 For example, in this comparison, one Page has a 6.4% engagement rate compared to 0.3% on the other Page. This means significant performance improvements are required for the Page with the 0.3% engagement. View an overall summary of performance of both Pages side by side. The more detailed comparisons that follow show graphs on areas such as the breakdown of post types. What’s interesting is that the Page with a much higher engagement is sharing significantly more pictures than the Page with a very low engagement rate. This is enforced further by the engagement matrix, where you can see that this Page has the most engagement on pictures, so it is clearly capitalizing on that. 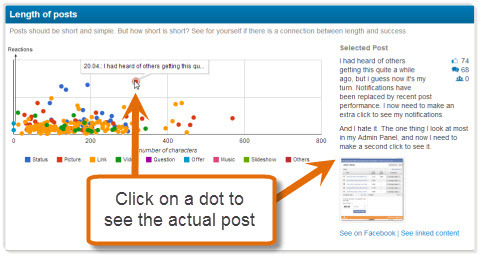 View an analysis of the type of posts each Page is using. The Posts per Day graph shows the distribution of posts each day, so you can see which days are the most active for each Page, while the posting frequency gauge shows how often there are posts to the Page. Here you can see a drastic difference in the frequency between these Pages. While one Page may not be posting enough, the other Page may be posting too much. In addition to the side-by-side comparison with one competitor, you can also do some benchmarking against a range of Pages. 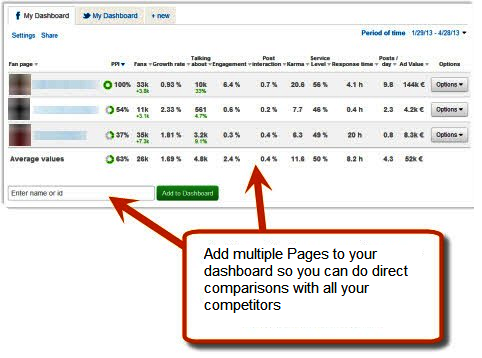 You simply add multiple Pages to your dashboard as shown here. View competitor comparison within a dashboard. The top section shows you a direct comparison on each Page’s KPIs, but if you scroll down you can do some further comparisons. For example, Performance Benchmarking is where you can compare how your Page is developing and growing compared to the competition over a period of time. 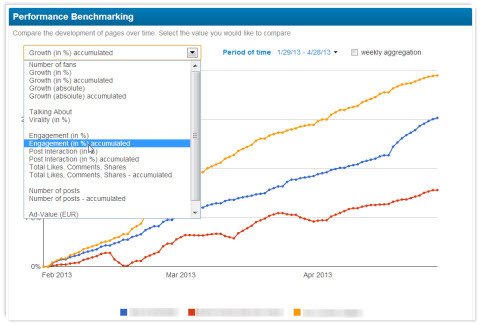 View comparison of key statistics between Pages. 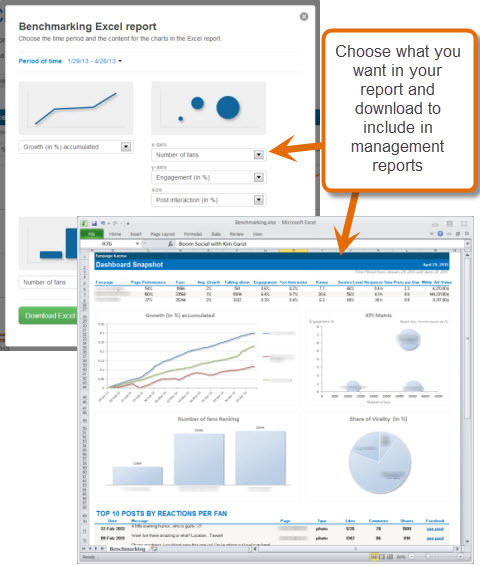 For each report, you can choose what information is displayed, and you can even download the report to Excel for use in your management reports or presentations. Export reports to Excel where further filtering is made available. #4: Are You a Conversationalist? Editorial Note: CScore and Recommend.ly are no longer available. CScore is a free analytics tool that does an analysis of your Facebook Page and then categorizes and scores it based on the behavior of your Page. 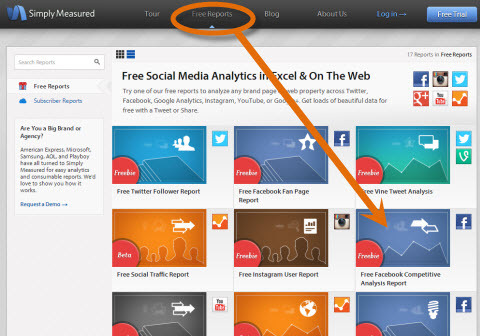 To run the report, just enter your Facebook Page name or your competitor. Just enter the Page name to do an analysis. Broadcasting. How frequently the Page initiates conversations; for example, posting updates, pictures, videos or simply asking a question. Response to Fans. How many posts the Page responds to. This includes responses to comments that someone made on a post or it can be a response to a fan’s post. Participating in conversations is seen as adding value to the Page. Virality. How viral the Page’s content is, in terms of both the quantity of responses and the quality of the responses. Fan Love. 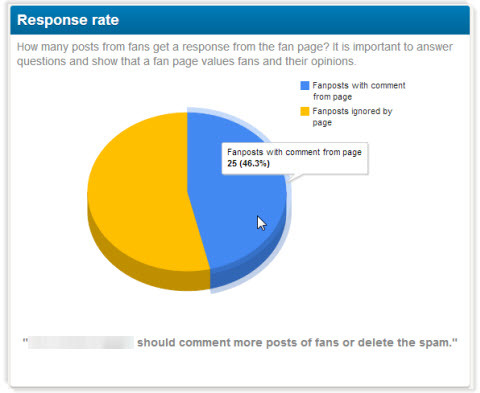 How popular the Page is with Facebook users (i.e., fan count and active fan ratio). While the fan count is taken into account, it doesn’t get as high a weighting as the other areas when determining the overall score. Here’s a sample report that was run on Kim Garst’s Page. Kim always has a lot of engagement on her Facebook Page and posts very regularly. You can see from the chart that 53 out of the last 100 posts contained images. Kim strongly encourages interaction on the Page and because of this, she is listed as a Conversationalist. In fact, based on the last 100 posts on her Page, she participated in 46% of the posts. With a high score of 85 out of 100, it is clear that Kim’s Page is doing well. Each Page is categorized and rated. However, to know how well you are really doing, it is always good to compare your performance against your competitors. You can run the report on any number of Pages. In addition, CScore also lets you look at the top scores for other businesses listed in the same Facebook category as you, so you can see how your Page compares against the best in your area. Just click on the Leaders tab to the right of the scoreboard. 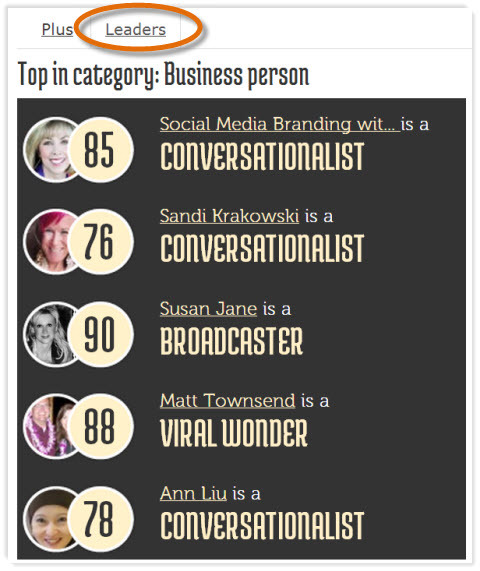 In the chart below, Kim’s Page just happened to be considered one of the top Pages in the “Business Person” category. Of course the comparison is only done against other Pages that also analyzed their Page using CScore. A comparison of other people within the Business Person category. Pick people on the list who have a higher or lower score or are categorized differently. Look at their reports more closely and see why that is. Viral Wonder. Fans and friends of fans tend to share or comment on the content a lot. Broadcaster. Shares a lot of posts with fans on a daily basis. Conversationalist. Listens and responds to fans and tries to strike up conversations. Fan Favorite. A very popular Page that is growing rapidly and has a high percentage of active fans. Starter. This is the lowest grade and is generally given to a new Page with very few fans and updates. 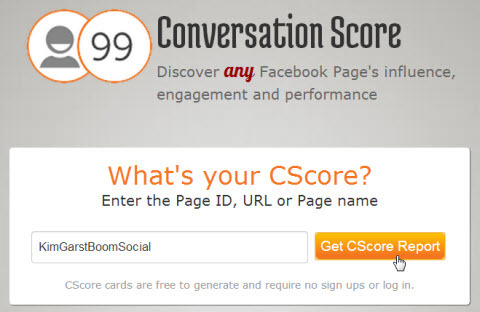 If your score is low and you want to improve it, you can connect CScore to your Facebook Page to get some recommendations for content. Log in via Facebook to get suggestions for content to improve engagement. When you connect, you are brought to Recommend.ly, which is a tool that recommends and posts content to your Page or profile. 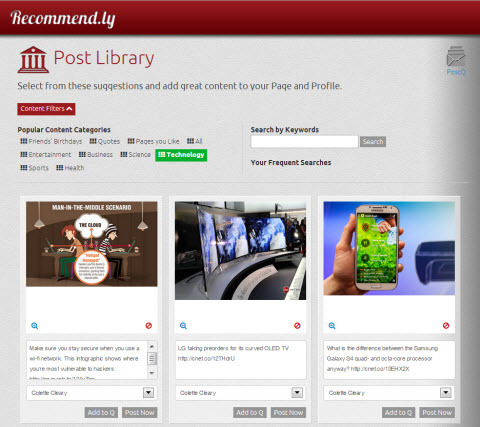 Browse recommended content and choose to post immediately or add to the queue for later. Once you find something relevant to your Page, you can then select one of the updates, change text if required and post it to your Page immediately. This can also be added to a smart queue where Recommend.ly will pick the most appropriate time to post the update. While I really like the idea of this tool, I did find it difficult to get good relevant content recommendations for my business Page. Simply Measured is a powerful reporting tool that provides a wide range of analytic reports for Facebook, Twitter and other social networks. Instead of offering a signup for a free 14-day trial, Simply Measured lets you get a taste of what they can provide by giving you access to a set of free reports. One of these is a competitive analysis report, which enables you to compare your Facebook Page against up to 9 other Pages to assess how well you are doing. 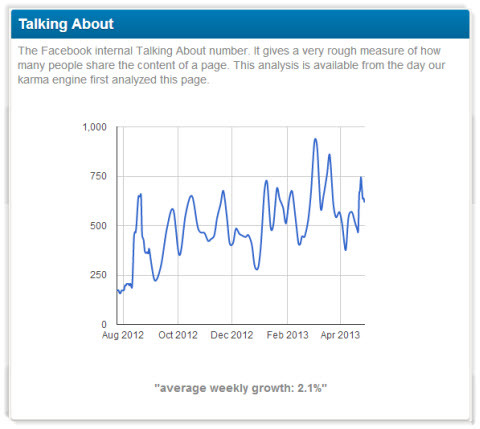 Select Free Tools from the menu at the top and choose the option for a Free Facebook Competitive Analysis Report. Select from a wide range of free reports to get started and see what Simply Measured can provide. For this report, you can enter up to 10 Pages that you want to compare, including your own Page. After entering all the Pages you want to run the report for, click Continue. While Simply Measured provides the report for free, they do ask you to like their Facebook Page to continue. Enter the names of all the Pages you want to run the report on. Depending on the number of Pages you are comparing, it can take a while for the report to generate. Therefore, you are asked to enter your email details so you can be notified once the report is finished. 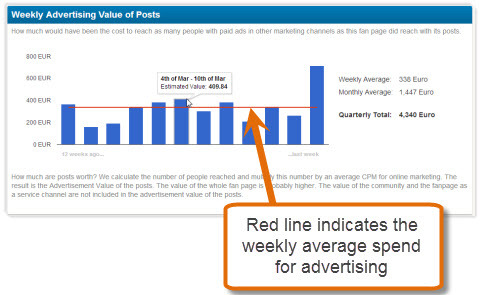 Competitive Analysis Report for up to 10 Facebook Pages. Once the comparison is complete, Simply Measured provides you with a very visually appealing and useful set of graphs for you and your competitors. Here is a breakdown of each subsection in the report. Competitive Leaderboard. A side-by-side comparison of the key statistics for all the Pages. Overview. An overview of the performance of the Page, including details such as a comparison of fans, fan engagement and people talking about the Page. Engagement on Admin Posts. Details on how much engagement posts were getting from fans. Are fans liking, commenting or sharing your posts? Community Health Details. Details on how responsive each Page owner was to fan comments. Ideally you want to be very responsive to fan comments as this encourages more comments. Content Details. A list of the top posts from each Page with details of each post. You can also export any reports produced to an Excel file or a PowerPoint presentation. When you export to Excel, there are some filters you can use on the data. For example, you can adjust the statistics so that they reflect a monthly, weekly, daily or hourly view. Also on the Content section, you can filter by engagement, likes, comments or shares and adjust the sort order. Change the sort order of the posts. There are various ways to improve performance of your Facebook Page and one of them is to track against your Facebook competitors. These are just a selection of tools to give you ideas on what you should be tracking. They can help you to better understand what your competitors are doing on Facebook and how this is working for them. You can then use this information to review your own Facebook Page marketing and identify the changes you need to make to improve your Facebook marketing results. What do you think? 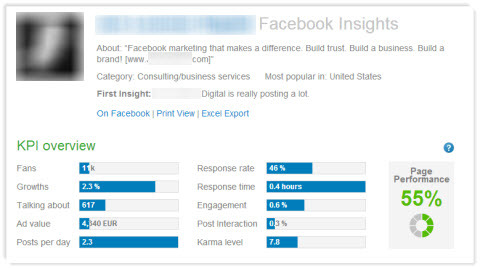 How do you track your competitors on Facebook? Are any of the tools above useful to you? Leave your questions and comments in the box below.